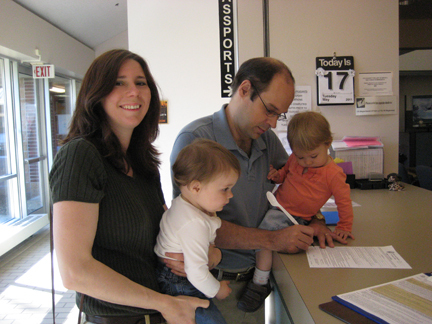 This morning I went down to City Hall with my inner circle of campaign advisors (pictured with me below, as I sign my Affadavit of Candidacy) and paid my five dollars to file as a candidate for re-election to the Maplewood City Council. I thought long and hard about whether to run. I've really enjoyed serving on the city council, and I'm proud of my accomplishments and of working with some great council colleagues and city staff to get Maplewood back on course. Still, it's daunting to add "re-election campaign" to my to-do list, along with actually serving as a councilmember, running my business, and trying to keep up with two very energetic toddlers. My decision was made easier by the many people who contacted me by phone, letter, and e-mail, and encouraged me to run again. You've persuaded me that I'm up to the challenge of running a winning campaign -- especially because I'll have your support and help to do it. Thank you.